Following a successful career as a professional photographer spanning two decades, Craig made the move off the mainland three years ago. “There’s a certain ambience about the people and places on Vancouver Island,” Craig explains. 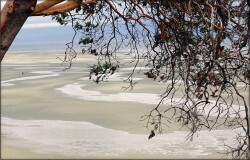 The walls of his Island Exposures Gallery in Parksville showcase so much more than traditional images of Vancouver Island often seen in mainstream travel brochures, websites and postcards. Craig freezes those particular Island moments that still manage to stop a long-time Islander in their tracks. “I go into a place like Cathedral Grove and I just want to capture it, take a bit home with me by taking pictures…I just love it,” says Craig, standing before one of his impressive coastal forest prints. It’s that love of place that speaks volumes in every unique piece, although for Craig most of what is said is expressed, and expressed well, without the use of words.